It’s that time of year again. Yep, the holiday season is upon us. And with all the stress of shopping and decorating and wrapping gifts – I LOVE IT! Every time I open another box of decorations, it’s like I’ve discovered a new treasure. I unwrap something I forgot I had, or even better, something that brings back a flood of sweet memories. What is your favorite holiday memory??? One of my greatest is decorating the Christmas tree. It seemed like every year we had a different style. Let’s see – there was the silver aluminum tree with a round light that turned to shine four different colors on it. Then there was the white flocked tree with huge orange ornaments and an orange light illuminating that one. But my favorite was the live Christmas tree. That’s the one we would decorate with tinsel. 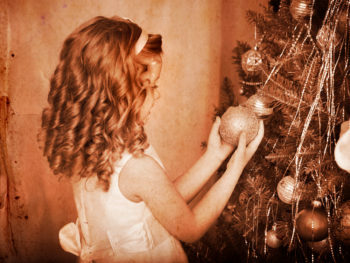 My Mom would make us hang each strand of tinsel perfectly until they flowed over and around each branch. It was beautiful – that is until our dog, Daisy, would crawl behind that tree and knock it over. Yes, every single year you could count on it. Everyone screamed as the tree crashed to the ground, ornaments shattering everywhere, and Daisy running to hide under the bed. Looking back now, it was quite a hoot. So this year, as I decorate my home, sans a dog, I can’t help but smile at the craziness and laughter that always surrounds this time of year. And I wouldn’t have it any other way. So please, take a moment and tell us about your favorite holiday memory. I’d love to hear it.